Another week is flying by and I have hardly even blinked. I apologize for not having a more detailed post today, but I have been working late and didn't have time last night. I did stumble upon this amazing editorial in Vogue by the incredible Grace Coddington (The model seems to be channeling Grace's hairdo). After seeing The September Issue I have a new found admiration for her and her talent. She is truly the creative mind behind Vogue. I am a sucker for florals and I think these get ups are mouth watering! I would love to have a few to mix into my fall wardrobe. Today I am heading into San Francisco for work and may stop by Zara for some new friends to add to my closet! I know! This shoot totally channels Grace! I love how wild and free these photos are! Great pictures! We love every single one! We want to see The September Issue....we have to go this week!!! I still need to see The Sept Issue! Love her fiery hair in this editorial. ahh! love the shoot... before my hair fell out, it was crazy and red like that - can't WAIT to have it back! ooo, love the floral prints too! Fantastic! love her gorgeous, fiery red hair!! The second to last floral number is beyond this world. 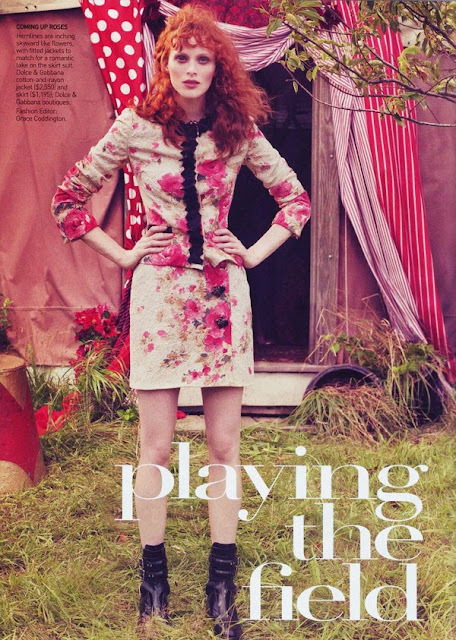 Karen Elson looks gorgeous in this spread. And i love the set design for it. By the way. Im definitely following your blog. I absolutely love it. Love these photos! Grace Coddington is absolutely amazing, so talented and creative! Oh what a gorgeous editorial!! !LOVE IT! This is the most beautiful editorial I have seen in some time. I love every piece of it. And the model is gorgeous. Karen Elson rocks my socks. She's sooo striking! really fabulous...and the florals are great.